As it should be. Surely I’m not the only person who thinks this. Almost every year of my adult life I have taken the month of January to recharge myself. In fact, for many years, the day after Christmas was a day when I’d gather all my knitting and weaving journals from past years and look through all of them, enjoying the inspiration and letting ideas for my own work wash over me. January is also my birthday month, so I get special dispensation to be selfish. I can put my post-holiday inspiration and project-planning into action by spending money on myself! There you go! This year I’m struggling to finish a shawl for a friend during my selfish January. This shawl should have been done back in November, but as I mentioned in another post, life has thrown some difficult stuff at me lately. I’m a bit behind schedule. I’m not worried though….I don’t mind having a selfish February if it comes to that. Back in October, I bought four balls of Crystal Palace “Mini Mochi” from my local yarn store (The Stitchery in Pearl River, NY) for “Lala’s Simple Shawl” (available as a free download on Ravelry). Just moments ago I bound off! I hope I have just enough left to make a crocheted scalloped edge around the shawl. If not, I have some Jaggerspun “Zephry” in a deep warm red that should fill the bill. I’d prefer the edge to be Mini Mochi, but it will be what it will be! I think these colors will suit my friend perfectly! She wears a lot of reds/greens/browns. The LaLa shawl is simple and not too lace-y so the pattern doesn’t distract from the wonderful color changes. It’s not blocked yet, so don’t judge it too harshly! I’m not feeling confident about that little ball of extra yarn making it all the way around the shawl….but at least I have the “Zephyr” as back up! Now to get back to Selfish January…. 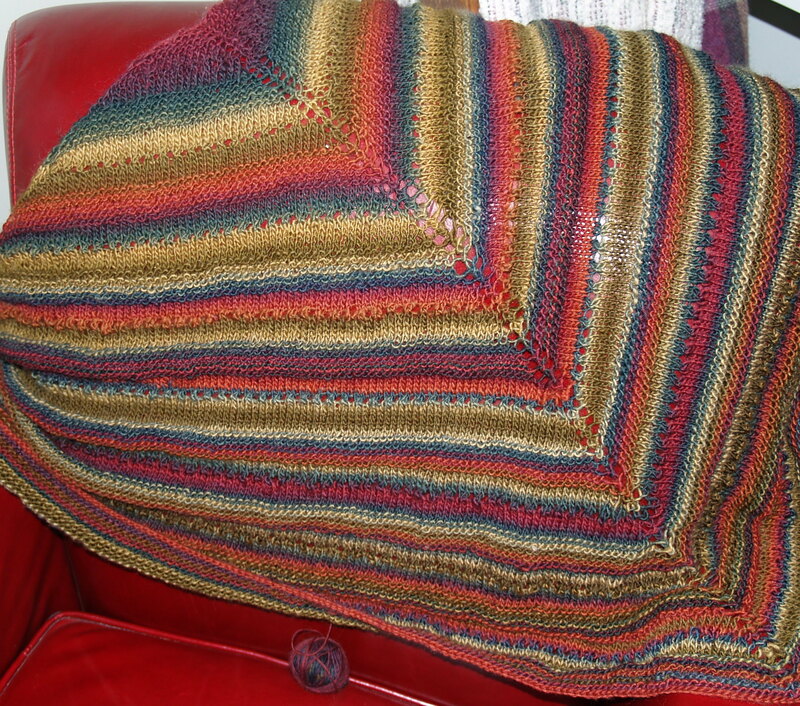 Here’s what has called to me….another shawl that is a free download on Ravelry. The shawl is called Revontuli which is Finnish for Aurora Borealis, which is Latin for Northern Lights. The designer is AnneM and you can get the pattern from either her site (follow the link) or here on Ravelry. Here’s the thing about this shawl. 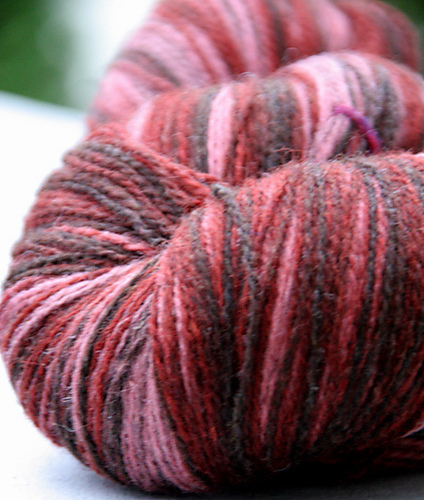 It looks best with a yarn that has l-o-n-g color runs. The designer shows this shawl made with a yarn called “Aade Long 8/2 artistic.” I did a search and discovered that it’s not available in the US, but is easily found on ebay and from an online shop in Germany, as well as from some individuals in Estonia. Selfish me…. I’m getting two colorways! “Pink/Brown” and “Red.” They are both coming from Estonia, although from two different vendors. 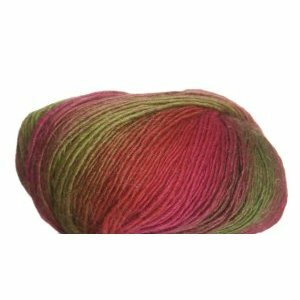 Let’s see how long it will take for each skein to arrive. Countdown starts tomorrow. Aade Long 8/2 Artistic "Red"
Aade Long 8/2 Artistic "Pink Brown"
This entry was posted in inspiration, knitting and tagged inspiration, knitting. Bookmark the permalink. 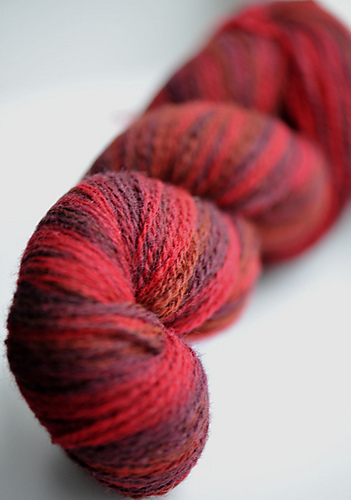 Really beautiful yarn. 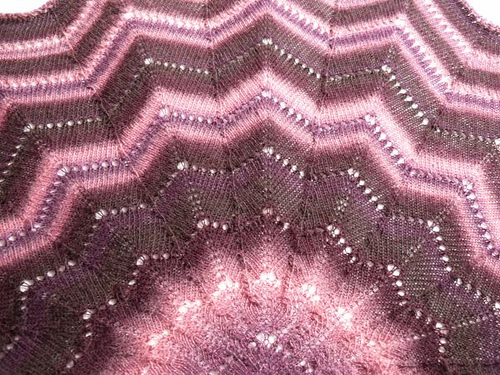 Love the colors of the shawl you finished. Your so good!